Several of you have asked "What is webbing"? OK, here's how I do it. Every time we handle our pieces, it's time consuming, so the less handling of individual units, the better. Here is my 9-patch. 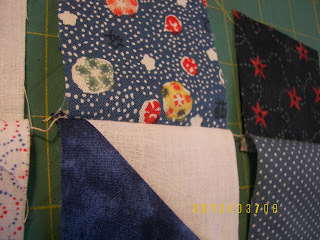 My half square triangle is pressed -- some pressed open, some to the dark - not much difference. A block with 36 patches is done the same as this 9-patch is done. At first I could not grasp the concept but I guarantee it's easier than fiddling with each unit numerous times. Lay them out in the correct order, and keep the same orientation each time. I'm showing you just one block. OK, now your 6 pieces are all together, kinda dangly - do not cut apart. It's easier to move one unit of 6, than it is to move 6 separate units. Now sew the top right on your block, sew on air about 3 stitches, then sew the middle right, sew on air and then the bottom right. Cut from machine but do not cut apart. I am not pressing yet. Now all the units are held together. See the connecting threads holding the whole block together? Don't get them too close together. These threads now take the place of pins. 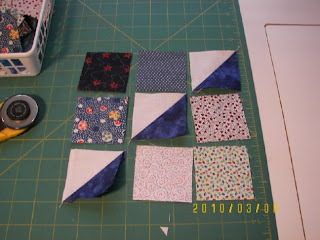 Now you sew the rows together, never dropping any of the units, or getting them in the wrong order because they are still connected together. (I couldn't take a photo and hold them together at the same time!) I finger pressed the seams in the correct direction, and when all was together, I pressed. I was 'on target' on practically each and very seam. Below is the finished block. 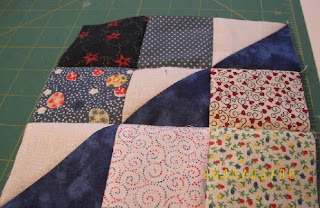 Keep in mind that the first time you try this, you will feel like "all thumbs" sewing the rows together. If you have left about 3 stitches you should have room to manipulate. Two stitches is tight and you might have to clip that thread when butting the seams together! Try it and let me know what you think. I avoided learning this technique for years - it just seemed too spider-webby! But I was stubbornly not open to suggestion. Now, I use this technique as much as possible. Wow, thank you! 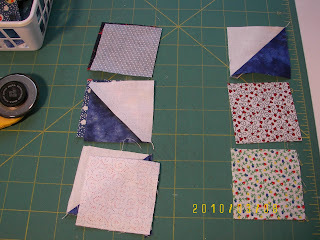 It's like chain piecing squared! Very cool. I will definitely keep this in mind, thanks for a terrific tip! That's the method I use, too! Never heard the term gridding, but it's sure a time saver. What a mind I have ??? I meant webbing, not gridding. Ahhhh, that's how I do it too. Now I know what to call it! Now THAT is a great idea! Thanks for sharing it! That's the technique that Karla Alexander uses in her Stack a Deck books. I understand now. 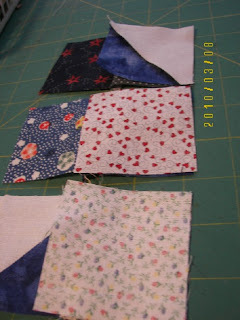 That is a method that Eleanor Burns uses when she sews quilt blocks. I just had never heard it called "webbing". I have Eleanor do that...and I love it! I understand it better now, thank you Elaine. I used that method (per our heroine Bonnie!) 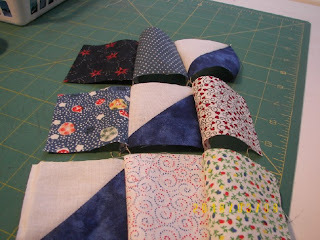 to sew together a quilt top once the blocks were all made, but never to piece just a block. Hmm, will have to give it a try! I'm liking the split 9-patch you're putting together. Oh, sure, I've done that -- just didn't know the term! Nice little tutorial you've put together. You know, you've given so many nice how-to's on your blog over the years, you might consider making a tab that lists them with a link to each. I am all thumbs most of the time. Your tutorial is good so maybe I'll try the method the next time I'm doing a nine patch. Great tutorial... many thanks for sharing this with us!!!! I haven't been able to master the webbing technique yet but if you say it is a good way I trust you and will try it again. Thanks for the tutorial!